Mórag is a Scottish female given name, sometimes translated as Sarah. It means "great", or "great one" (MÓR is great in Gaelic). Dunvegan (Gaelic: Dùn Bheagain) is a town on the Isle of Skye in Scotland. It is famous for Dunvegan Castle, seat of the chief of Clan MacLeod. The name Dunvegan is Scottish Gaelic for "small castle". 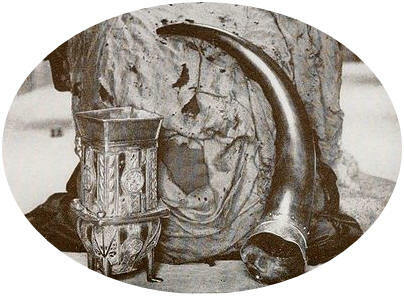 The castle houses a number of family and clan relics; chief among them is the famous Fairie Flag of Dunvegan, the Dunvegan Cup, and Sir Rory Mor's Horn (shown above) as well as the MacCrimmon Pipes. The Fairy Flag is an heirloom of the MacLeods of Dunvegan, chiefs of Clan MacLeod. There are numerous traditions relating to its origins and magical properties. Most of these traditions state that the flag originated as a gift from fairies. The flag has been examined numerous times over the last two centuries; and since this time its condition has somewhat deteriorated. The flag has been stated to have been made of silk originating from the Far East and that it may have been an important relic of some sort. Others have attempted to associate the flag with the Crusades, and even the raven banner which was said to have been used by various Viking leaders in the British Isles.